Chippewa Valley Electrical Cooperative (CVEC) began building their new headquarters office in the fall of 2014. CVEC has a proud history of promoting energy saving solutions to its 7,500 residential and commercial customers. So, when it came time to select an HVAC system for its new facility, CVEC felt it had to lead by example. As the saying goes, “Practice What You Preach,” was in order for Chippewa Valley Electric Cooperative (CVEC) who promotes energy saving solutions to residential and commercial customers. CVEC required an HVAC system they could showcase in their new office, that was highly efficient, easy to maintain, quiet, comfortable and centrally controlled. Daikin’s VRV-W water source heat recovery system and centralized Navigation control system created the showcase HVAC system that CVEC desired. A geothermal condensing loop, connected to a VRV-W water source heat recovery system, maximized the system efficiency. 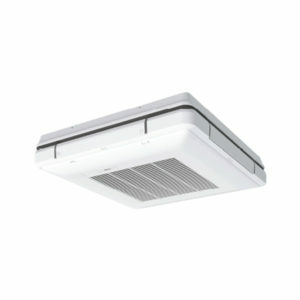 The compact, quiet system was easily installed in an interior mechanical room for easy monitoring and maintenance. Chippewa Valley Electrical Cooperative (CVEC) began building their new headquarters office in the fall of 2014. CVEC has a proud history of promoting energy saving solutions to its 7,500 residential and commercial customers. So, when it came time to select an HVAC system for its new facility, CVEC felt it had to lead by example. The HVAC system needed to be highly efficient, easy to maintain, quiet, comfortable and interlocked with a make-up air system using centralized controls. A variety of systems were reviewed for the project. 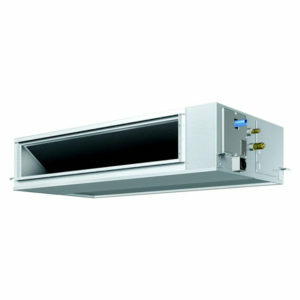 These included traditional water source heat pumps (WSHP), water cooled VRV, and four-pipe fan coils. After thorough analysis, a Daikin water cooled VRV-W heat recovery system with i-Touch Manager with BACnet® interface was selected. A Daikin VRV-W heat recovery system provides a highly efficient heating and cooling solution for the variety of fan coils located throughout the building’s office space. 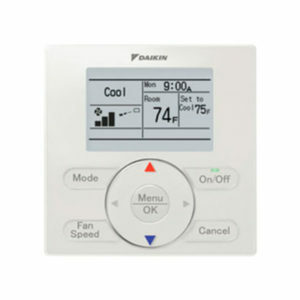 Compared to the previous office space with baseboard electric heating, the new office, with multiple fan coils, provides more zoning control and subsequent comfort. VRV-W condensers are connected directly to a closed-loop geothermal field providing additional efficiency opportunities and the ability for the VRV system to provide heat in extreme Wisconsin winters. A small, single computer equipment server room required 24-hour cooling and individual temperature control. Wall space for computer racks was too valuable to hang a wall unit, and using a ducted unit for only one room didn’t make sense. A single 4-Way Blow Ceiling-Suspended Cassette was installed centrally within the computer room, but not over top any computer equipment. This was a perfect application to simply attach the lowprofile cassette unit to the concrete ceiling. A non-VRV system conditions other portions of the facility. The geothermal water loop also supplies heat to water-to-water heat pumps. The heat pumps provide hot water for in-floor radiant heat in an equipment bay and four feet inside the perimeter of the building. 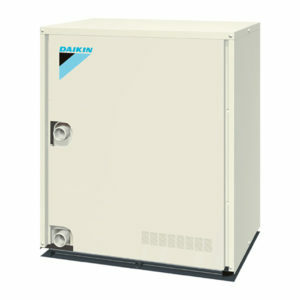 The Daikin VRV system fits the budget of traditional WSHP equipment, while offering high efficiency and the ability to consolidate the condensing units in one mechanical room. Additional performance gains, as compared to the old, previous office space with electric base board heating was captured through the VRV system’s ability to modulate condenser water flow according to the building’s heating and cooling demand. 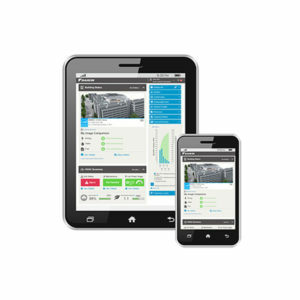 Water flow was modulated using customized programming implemented through a Daikin i-Touch Manager (iTM) centralized control and add-on control modules. The iTM and add-on control modules were also able to control non-VRV related equipment including bathroom exhaust fans and energy recovery ventilators for the office area and makeup air control for the equipment bay area. CVEC has been very impressed with their VRV-W water cooled system. “The power bill for the entire year, using the VRV system, was equal to one month’s heating bill with the old system,” said Russ Falkenberg, Director of IT and Member Services, CVEC. Chippewa Valley Electric Cooperative (CVEC) is a nonprofit, member-owned, organization located in Cornell, Wisconsin. CVEC began providing rural electric services to its members on March 17, 1938. Their territory includes most of Chippewa County, in addition to parts of Barron, Dunn, Rusk and Taylor counties. A total of 22 employees work to serve approximately 7,500 members across nearly 1,300 miles of distribution line. CVEC has participated in energy saving and load management programs for over 30 years. First, with programs to curtail usage of electric water heaters during periods of peak demand, and later with Dual Fuel programs, offering electricity for electric heat at a reduced rate in return for curtailing the use of electric heat during periods of peak demand. These programs made it possible for CVEC to manage system loads, reducing the need for additional substations. CVEC has also promoted the use of energy saving lighting when new technologies emerged. They were among the first in the area to incentivize the use of compact fluorescent and LED lighting with rebate programs. Rebate programs have expanded to encourage the installation of energy saving appliances and HVAC systems.